Middle-schooler Brian Sawaya is a catalyst for change. 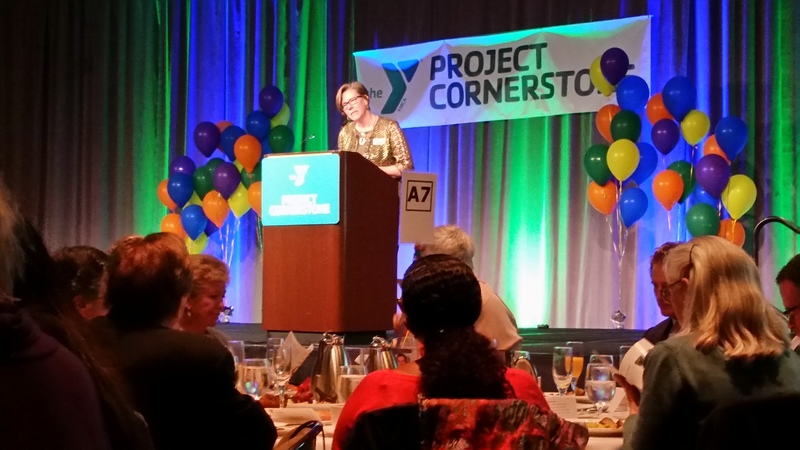 At Project Cornerstone’s Annual Assets Champions Breakfast, a community initiative of the YMCA Silicon Valley, Brian was nominated for the Positive Peer Influence Award. When accepting his award, he just barely peeked over the podium. However, Brian’s voice boomed through the microphone as he humbly spoke about becoming inspired by the leaders of his community to create change. Brian told the story about how he created a FunZone at his school–an area in where students don’t have to be alone during the lunch and recess hour. He created and implemented games for every lunch during the entire academic year. He also presented awards to numerous youth and community leaders, including American civil rights activist Ruby Bridges. Through school partnerships and emphasis on developing positive relationships, Project Cornerstone helps local youth, like Brian, become catalysts of change within their schools and communities. As Search Institute’s research tells us, developing healthy relationships with peers is a key to students’ success inside and outside of the classroom. Brian’s FunZone cultivated those key relationships. For over 20 years, Project Cornerstone has partnered with Search Institute and used it to develop positive relationships among youth in Silicon Valley. Anne Ehresman, Executive Director of Project Cornerstone says her organization aims to equip youth, like Brian, to take the tools provided and put them into practice. “We want to help kids understand their feelings, resolve conflicts, deal with bullies, and really learn to lay the social and emotional skills they need in order to create healthy peer relationships and become more engaged in schools,” she says. However, Project Cornerstone would not be able to succeed without the help of Search Institute. Over 20 years ago, Search Institute developed the Developmental Assets framework, 40 research-based, positive experiences and qualities that influence young people’s development, helping them become caring, responsible, and productive adults. Every five years, Project Cornerstone conducts Search Institute’s Attitudes and Behaviors (A&B) survey, a measurement of the 40 Developmental Assets, to more than 43,000 students. This survey allows them to better understand the youth in their community, giving them a voice. Project Cornerstone analyzes and celebrates their survey findings and important accomplishments at their Annual Assets Champions Breakfast, where they also acknowledge outstanding schools and educators in the California area. “So many people want to make a difference and this framework has helped connect them to each other and helped kids become their best selves,” according to Ehresman. Project Cornerstone also supports 215 elementary and middle schools through a program called the ABC Program. The ABC (Asset Building Champions) Program is an elementary literacy program that incorporates the Developmental Assets into reading time. Once a month, parents read stories that focus on one of the Developmental Assets, which help young children learn about social skills, explore empathy and sympathy, and better understand themselves and their peers. Ziem Neubert, Director of School Partnerships at Project Cornerstone and a reader within the ABC Program herself states, “I’ll never forget one little girl told me I was like her second mom.” These once a month reading times impact these children so much that some even become catalysts of change in their communities later in life. One child, in particular, returned to Project Cornerstone after being a participant in the ABC Program, in the hopes of impacting others. Joselin Maeyama is currently a high school student who knew since kindergarten that she wanted to make a difference. Her kindergarten class participated in the ABC Program. Learning the Developmental Assets at such a young age made such an impact on Joselin that she wanted to rejoin the ABC Program– this time as a reader. She reached out to Project Cornerstone volunteers and became the first youth reader at two elementary schools, formerly only permitted as adults. Joselin knew she wanted to be a part of a program that can change a child’s life in the same way it changed hers. This year, at the Annual Assets Champions Breakfast, Joselin was awarded the Trailblazer Award for creating something new for other people to follow. Project Cornerstone’s 20-year partnership with Search Institute has improved the lives of many young people in the California area. The partnership between the two organizations is crucial to the future of The Developmental Assets and the future of Project Cornerstone’s central mission of creating catalytic change.